Vous souhaitez poser une question à l'établissement Villa Moreeda ? Parfait pour le plaisir et la détente, le Villa Moreeda se trouve dans le quartier de Suan Phueng à Ratchaburi. Situé à 60 km de l'animation de la ville, cet établissement 4 étoiles jouit d'un excellent emplacement et permet d'accéder aux principales attractions touristiques de la ville. Entretien impeccable et proximité avec Baan Hom Tien Suan Phung, Tummasathan Wimoksivalai, Ferme ovine Newland confèrent à cet établissement un charme unique. Le Villa Moreeda offre un service impeccable et tous les équipements nécessaires au bien-être des voyageurs fourbus. L'établissement donne accès à un vaste éventail de services, dont WiFi gratuit dans toutes les chambres, magasin de souvenirs, accessible aux personnes handicapées, WiFi dans les espaces communs, parking, pour n'en citer que quelques-uns. Toutes les chambres ont été conçues pour le plus grand confort des hôtes. La plupart d'entre elles disposent même d'une gamme d'équipements tels que télévision écran plat, accès internet (sans fil), internet sans fil (gratuit), chambres non-fumeurs, climatisation, et bien plus encore, qui satisferont les clients les plus exigeants. Une ample gamme d'installations de loisirs, dont bain à remous, bain en source thermale , spa, massage, jardin, est à disposition dans cet hôtel. À tous ceux qui cherchent confort et commodité à Ratchaburi, posez vos bagages au Villa Moreeda. Cet hôtel n'est pas recommandé aux jeunes enfants et aux personnes âgées. Les animaux domestiques ne sont pas acceptés par l'établissement. Nice view, near the small canal. Very good location for relax. Helpful staff and have the small shuttle to Scenery farm. Have authentic breakfast. But be careful for the small children because the stair is quite high. Nice staffs, good location for relaxing. Breakfast was delightful, either as buffet or à la carte set. While the Canaries room impressed us, we could use more light as the current lightings in the room are too few and dim - we can hardly read a book or check emails in the evening. Nice place soaked in nature. We love the overall setting and layout of the whole resort. The resort has a variety of room types and interior design that fit our style. Love it. Lovely breakfast served with nice neighbors. For those who like “B n B” environ, this is it. You feel warmly welcomed since the time you check in. The hotel has nice and cool designs that you will easily fall in love with. The staff are very friendly and helpful. Even staying with small children, they provided me with all the support I need. The hotel is interesting with lots of photographic opportunities, from the main public area, leading all the way to your room. Also, being right next to the sheep farm allows us ample time for some activities especially when trying to teach our son about nature and animals. Will come back for more peace and rejuvenating time. This review is telling about unexpected private BBQ dinner. As we were there for 8 adult and 4 kids , I decided to have a dinner at the hotel. Beside of a la carte food which we choose on our own when checking in. They recommend for BBQ set, so I ordered 2 sets of them ( no seafood would be provided only Pork and Chicken, it must be great if you can serve ^_^). They have two choices, ready grilled or we grill ourselves. I choose to grill on my own. Staff set the dining table with professional but lovely, a BBQ charcoal grill was place right the table. My family are enjoy this activity very much, it was privacy with no additional cost. We can eat and talk like we are at home, no rushing to turn the table. Not so many chance, we can cook together with no need to prepare or clean after. Don't be worry if every guest would have a dinner the same time. They are well organized, all of us have a private area by without disturbing to each other. How much should be paid for private dinner by the canal in the green garden?. they are cheaper than you thought, affordable with reasonable.Service also great, even they are so busy but smile all the time. Beside of room which is the best view, this kind of activity is most recommend. You can find the luxury bed and bathtub in so many hotel, but meaningless if your vacation are only in room. I've been here before as a couple but this time with my family. I booked 3 rooms; Crane, Rainbow finch and Macow. This review would refer to Rainbow finch and Macow which were the same building. Surprisingly, every rooms faced to the green garden and tiny canal. Each room did not engage to each other, so it like to stay away from other guest. Staff are so nice and helpful but not the same as 5 star hotel, coz they are a luxury boutique resort, they treat you with warm service and sincere.As it close to Scenery Farm, your kids are absolute enjoy the activity there anytime, since all guest has a rights to access during a stay. next review I would refer to Private BBQ dinner and breakfast with Crane room. I could repeated over and over again and do not hesitate to recommended Villa Moreeda to anybody. The hotel is close to many attraction so convenient to travel but yet you still feel private and sense hideaway feeling. The room was well kept and decoration are superb. Hotel facility are top score. The staff are very please and kind, I would give them 11 out of 10 score. Every body seem to pamper us very well. The food was soooooo delicious, every thing we order like taste from heaven and Villa Moreeda Thai's style breakfast are the best I ever had. Recommended for every body, you will love Villa Moreeda. I can feel made from the heart architect and interior designs. Location is also good, peaceful and closed to nature. Best place for relaxation. We are happy with Villa Moreeda a lot, nice place and friendly service. The room is quite big and decorated with lovely peacock everywhere. The place is just behind Scenery Vintage farm and you can get there with the resort's golf cart. Believe me, you need more than a night here. That was a great stay! Location : in Suan Peung, next to the Scenery Sheep place. Easy to reach there by car and easy to get stuff to eat. Villa: That was fab. because we looked for the quiet and natural place with lots of trees and water! that's Lam Pa chee passing through the place. The place we stayed was the 2nd floor villa named Fairy Pitta- comfortable, vintage deco, nice view. The room was clean, comfy and nice by the room itself and the view through the big glass wall. Dining : free Big breakfast. Unfortunately,during the day the kitchen was closed as the chef was injured! Spa : it was closed by that 3 days. That was quite disappointed for us! Service : Local staff were all friendly. Overall : GREAT and Recommend! "Fairy Pitta" offers exceptional floor to ceiling view of the entire ground but upon our check in the air-conditioning has gone out so we were moved to "Cockatiel". The room has a nice feel to it with an oversized bath and shower although the view couldn't measure up to the one that Fairy Pitta is known for and is somehow less private. But I love in-room amenities provided, wonderful interior and a complimentary mini-bar which of course are a plus. It would have been more pleasant however to replace the air-conditioning which I found to be a bit loud to a more quiet system to increase the sleep quality for resort guests. I would extremely recommend this hotel to family or couple travelers who are seeking a private and unique hotel. 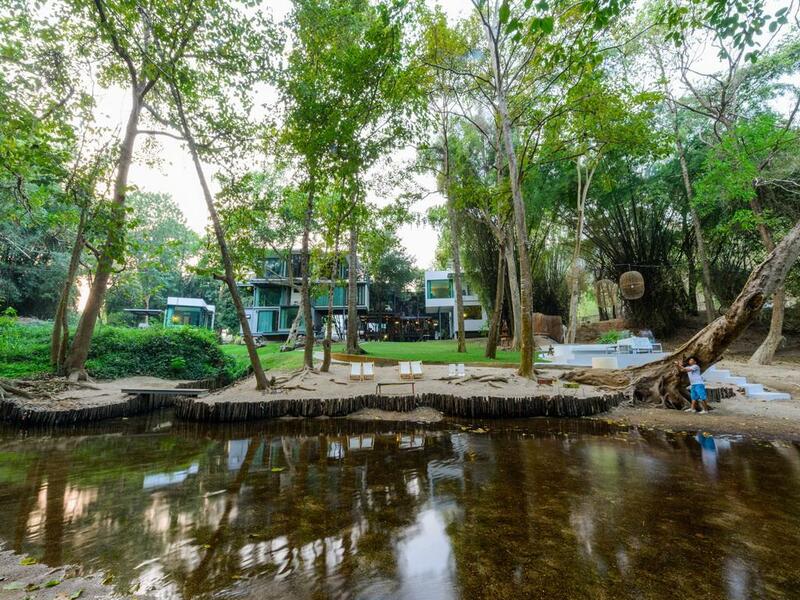 This hotel has only 10 different rooms but all room are facing to the nature. It is located by the cleanliness canal with well maintenance garden. All staff are friendly and warm welcome such you are visiting your relatives. Room are very stylish design but very close to nature. Breakfast also be very stunning for me, since they serve Thai Traditional breakfast; Sticky rice with grill pork, northern sausage, organic instant coffee, honey jam, Thai curry with jasmine rice.....By the way, as you read my comment above, you may found that it's not suit to party group with alcohol since they may ruin the atmosphere and make a messy noise to other guest , except you will take all 10 rooms indeed. The room was clean, the staff was very helpful and friendly. The room is very nice, such a relaxing vibe. the breakfast is delicious. It' s wonderful place. Very good place and good view. The room and decoration are great with the design and surrounded environment but mattress is uncomfortable. Breakfast served with full option and delicious but Dinner is not good. It’s small and quiet resort, but it’s okay for couples.